The Rosette Nebula (NGC 2237, Caldwell 49) in Monoceros is a showpiece astrophotography object for telescopes of any size, resembling a large open flower with an open cluster of stars (NGC 2244, Caldwell 50) in the darker center. It lies about 5,200 light years away and is 130 light years across. The stellar winds from these young, hot stars are clearing the center portion of the nebula, but their ultraviolet radiation is so strong that it still causes the rest of the nebula to glow. Initially, 36 stars were identified to make up the cluster, but Chandra space telescope X-Ray data increase that number to about 160 stars and showed that this is a place of new star formation from all the dust and gas. 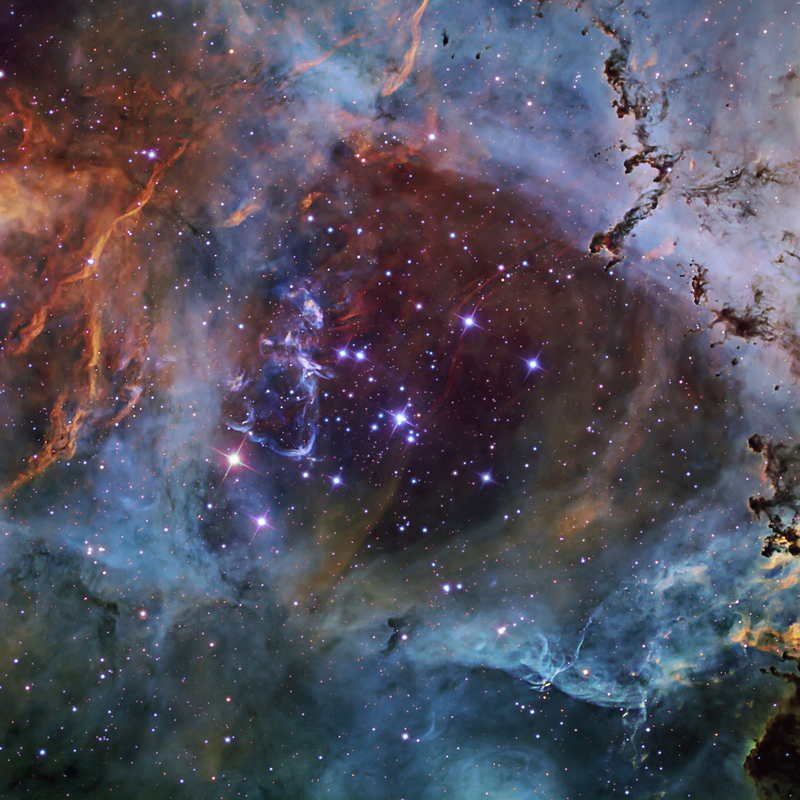 Note the huge, dark spires of dust projecting toward the center of the Rosette. I wish to thank my observatory partner, Chris Purves, for collecting the data and letting me process them. Hello! I love your astrophotography and am wondering if you sell prints/posters? I would love to have “In the Heart of the Rosette” framed on my wall. Please let me know. Thanks, Sarah. What size are you interested in? At home, I have a 36×36″ mounted on my wall and it looks great. Please reply to don@astrodon.com.